Greetings! 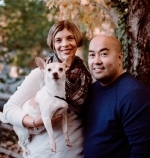 We are Paul and Francesca, and we are honored to be considered to be adoptive parents. We have been married for 4 years and have known each other for 12. Paul works as a general contractor and is also part of a property management team in Central Pennsylvania. Francesca is a physician for a Pennsylvania Health system. We both have flexible schedules. We enjoy traveling, hiking, trying new and local restaurants, exploring new wineries, having bonfires with our friends, hiking, biking, and spoiling our cat Fussy. Paul spends some of his free time baking, gardening, inventing new tools for his job, and fixing appliances. Francesca enjoys working out, cooking, reading medical literature and mystery novels, and learning new skills such as knitting. Family is very important to us. We visit Francesca’s family often because they live in Pennsylvania and Maryland. Paul’s parents are in Tennessee and his brother in Florida so we make it a priority to visit them at least twice a year. We have so much love to share and our hearts are open to adopting lives that have already been created as this is an amazing privilege. We will dedicate our lives to creating a lifetime of happiness, laughter, wonder, and memories to any child who is placed in our home. Hi! Thank you for taking the time to meet us! We are Adam and Lauren. We both grew up in the suburbs of Philadelphia. We were friends in high school but began dating and fell in love several years later. We have been married for 11 years now. Adam is an attorney at a Central Pennsylvania law firm where he practices labor and employment law. Lauren is a physician assistant in Orthopedic Surgery at a Central Pennsylvania hospital. We live in a small town with tons of wonderful neighbors and children close by. We both love the outdoors, traveling, and spending time in the mountains with our friends and family! Adam likes playing sports, fishing, running and golfing. Lauren enjoys running, music, arts and crafts and loves to cook! We have a very sweet five-year-old dog named Molly who loves to swim in the nearby creek, and join us on walks, runs, and family weekends. We are extremely fortunate to have adopted our three-year-old son Bern in March of 2015. He is fun-loving, affectionate and hysterical! He brings our family endless joy. Bern loves swimming, building sandcastles, playing with his friends, pretending to be a football player and playing the drums and trumpet. He also loves to talk to and care for younger children. We are hoping to grow our family and share our love through the adoption of another child. Together with Molly and Bern, we have a lot of love to give! Thank you for taking the time to learn a little bit about us. We would be grateful for the opportunity to talk with you in person! Hello. We are Chris and Cathy. We were lucky enough to find each other over a dozen years ago and have spent most of our adult lives working with children. Three and a half years ago we were chosen to adopt Andy. We cannot imagine life without him—he brings so much joy, love, and excitement daily. We are the luckiest people in the world! Andy’s birthparents were high school students who wanted an open adoption. We keep in touch with them frequently and they visit us a few times a year. Chris teaches special education and Cathy teaches high school science. Our careers allow us to have regular hours, weekends and summers off, and we love spending this time as a family! We live in Central Pennsylvania in a three-bedroom ranch home with a game room and large backyard and gardens, including a pool and plenty of space to run around or play games. In addition, there are three parks and some restaurants within walking distance of our neighborhood. We would love to add to our family and allow Andy to grow up with a sibling. In our down time we love listening to music, watching movies, cooking, and spending time outdoors. We enjoy hiking, biking and just nature in general. Our summers are packed with day trips to local parks, visiting family and friends, and vacations to the mountains, lakes, and shore. Thank you for taking the time to get to know us a little better and please consider everything we have to offer for your child. Hi! We are Jason and Katherine! We met in January 2014 and fell very quickly in love and were married by November of that year. Katherine is an attorney specializing in school law and Jason works in the wild world of politics. We are both fortunate in that our jobs offer flexible scheduling and generous amounts of time off. Katherine loves playing and coaching soccer and Jason enjoys playing golf, but we most love spending time with each other and supporting each other in our activities. Our parents live very close by and we enjoy seeing them as often as possible. We are both very active in our local parish and in our community. We have a five-year-old Jack Russell/Chihuahua mix, and we love playing with him and taking him on walks around our family-friendly neighborhood or in local parks. Travelling and experiencing different people and cultures is also something we like to do on a regular basis. We very much look forward to expanding the amount of love we share by growing our family through adoption. We currently do not have any children and are longing for the joy of parenthood. Thank you for allowing us to share a little about ourselves and we look forward to sharing more with you in person! Hello, we are Ryan and Karen. We have been married for 14 years and are college sweethearts. Karen has worked in the behavioral health insurance field for the last 13 years. Ryan has worked as director of websites for the last 13 years and just within the last 2 years started his own internet company. We have a beautiful 3 bedroom house in a friendly community, which we have lived in for the last seven years. We have a lovely dog who is 13 years old and is quite spunky for an elder dog. We love spending time with our friends and family and enjoy the outdoors along with going to the gym. Football, baseball and hockey games are some of our favorite pastimes. Since the time we got married, we have wanted to start a family and have a child. We found along the way that Karen cannot conceive a child after a trial of IVF and fertility help. So we are hoping adoption will be the answer to help us on our journey to being parents. We are hopeful that we can be blessed to bring a child into our home someday so we can share and make more happy memories. Thank you for taking the time to read a little about us. We are awaiting the day that we can become parents and share our love with a child. Hello! We are Steph and Mike. We have been happily married for almost eleven years. Steph works for a large health insurance company designing databases and doing reporting and analysis. Her job gives her the luxury to work from home. Mike works part-time as a counselor for a county-run human services program. The other half of the time, he works as a film critic, writing for several websites and radio stations. This second job also allows him to work from home part of the time. 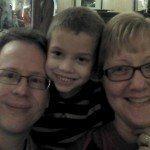 In 2008, we were blessed enough to adopt our son Logan through Catholic Charities. This was a wonderful experience that we are eager to repeat. We are very family-oriented people. Our spare time is spent on a variety of family activities, including outside play, seeing movies, listening to music, visiting children’s museums, playing games, reading books together, and going to church. We have many family members and friends nearby. Choosing adoptive parents can be an overwhelming process, so we want you to know that we respect your decision and can promise you a loving, supportive, nurturing home for your child. We would love to meet with you and tell you more about ourselves! Hello, our names are Paul and Becky. We both graduated from college in 2010 and were married in 2011. Since the day we were married, we have dreamed of starting a family of our own, but we have learned that we will never be able to conceive a child. We have been blessed to spend our days working with children. Paul is a fourth grade teacher at an inner city elementary school and Becky is a fifth grade teacher at a Catholic school. Paul is an energetic and outgoing man who loves making people laugh and getting to know others. Becky is quieter than Paul, most people are, but she enjoys baking and spending time with family and friends. We purchased a new home when we got married in 2011 and have spent the last four years making it our own. Our community is quiet and family friendly. It includes a lot of parks and places for family activities. Together we enjoy spending time outdoors, watching and playing sports and going on trips. We are very active in our church and spend a lot of time helping others. We are very thankful that you have taken the time to get to know us a little bit, and we would love to answer any questions that you still have. We are anxiously awaiting the day that we can become parents, so we can share the love we have for one another with our child.